Pádraig is not there yet. 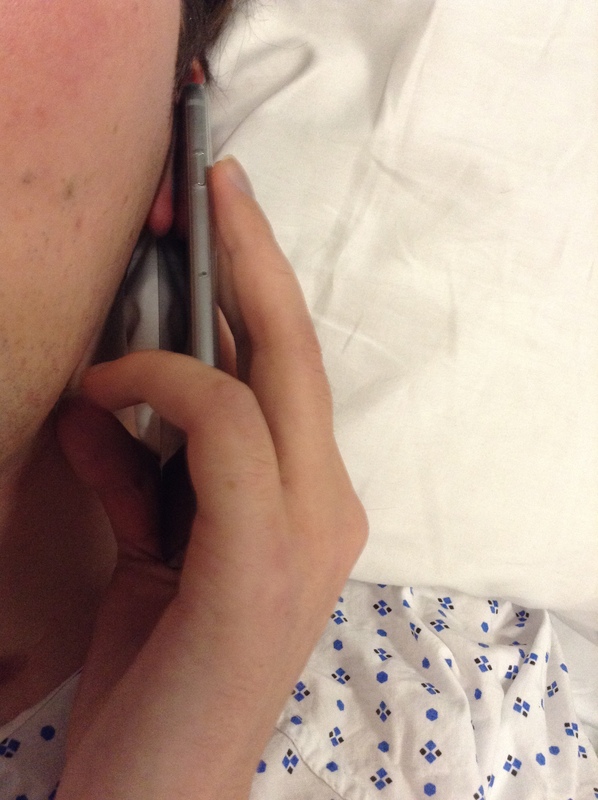 But he holds the phone to his ear and listens. He has been taking calls for a long time. Not “Germany calling” but “Calling Germany”. (An interesting one for linguists: how word order can change the meaning dramatically:) He is not talking yet, but there is an attentive expression in his face, there are mouth movements, and there is, at times, a reluctance to give the phone back. Pádraig is continuing on his spelling adventures. It was three letter words today. He is also continuing to eat much better and faster, and to drink better and faster. They started him on a medication that is usually used to get people to sleep. It could all be coincidence, but he might be one of the very few people for whom it has the opposite effect. In any way, there are great plans to develop his spelling much further. I remember the day when a speech therapist in Germany first put a speaking valve in his tracheostomy, and we could hear his voice again for the first time since the accident. One day, he won’t ‘just’ be spelling, but talking, loudly, saying ‘hello’, giving out, discussing, questioning, telling us what he thinks.